(L to R) Baby Kale Salad, Short Rib, Roasted Sea Bass, Signature Steaks & Chops: Tomahawk Steak, and Fall Harvest: White Chocolate Carrot Mousse. 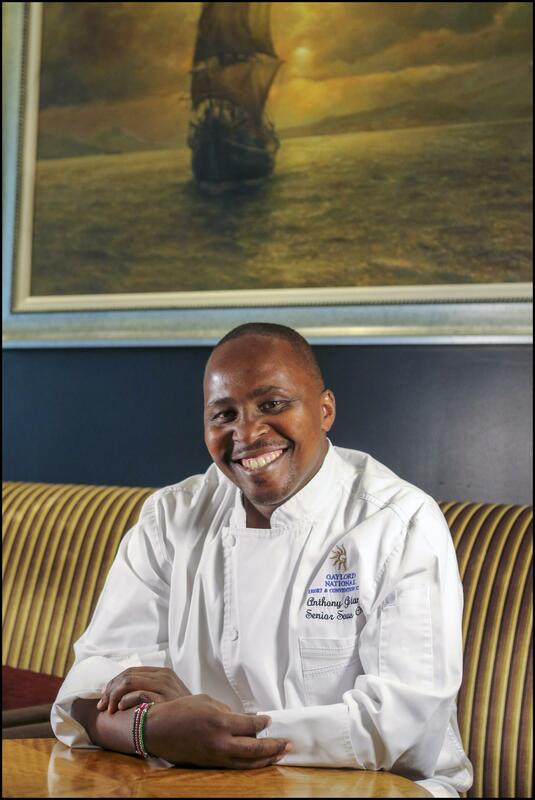 Chef Anthony Gitangu moved to America from Kenya in 1996. In 2007, he graduated from L’Academie de Cuisine culinary school in Gaithersburg, MD. Gitangu then went to work and train at Vidalia restaurant in Washington, D.C. under chefs Jeff Buben and RJ Cooper. Gitangu joined Marriott International, Inc. in 2008, where he successfully worked his way up in the kitchen holding a variety of chef positions at area Marriott properties. In 2016, he joined Gaylord National Resort and Convention Center as the Senior Sous Chef at the resort’s signature restaurant, Old Hickory Steakhouse. I first became interested in cooking at 5 years-old. I was a young boy in Kenya and was always fascinated by food. I would watch my mother cook and she taught me how to prepare goat. I originally went to school for finance. My first job in the USA was in the kitchen as a dishwasher. I would watch the chefs cook, then go home and try to duplicate what I had learned. I would also watch a lot of cooking shows and read cook books. From there, I realized I wanted a career as a Chef. I have always been passionate about French cuisine, so my biggest inspiration during my career has been Chef Michel Richard. I had the opportunity to work with him and always appreciated his simple, yet elegant culinary style. Chef Marcus Samuelsson has also been an inspiration. He has as similar style of cooking to me in that he likes to bridge African food with other styles to create a unique sense of flavor. Guests at Old Hickory Steakhouse will find my personal flavors best represented on the restaurant’s specialty menus. We always use fresh, local and seasonal products. On our winter menu, we have a braised short rib with kohlrabi and sweet potatoes; butter poached lobster with leeks and fingerling potatoes; sea bass with chanterelles and chick peas; roasted carrot and kumquats salad; and a kale and persimmons salad. Each dish was created by me and offer unique flavors paired with fresh, seasonal ingredients. I consider myself a fusion cuisine chef, where I bridge together my different culinary traditions, specifically French and African cuisine. I incorporate a variety of African spices in my dishes including cardamom, juniper, curry and cumin. They are very flavorful without being spicy. If any chef in the world (past or present) could prepare your meal, who would you want that to be? I would love to have Chef Stephen Stryjewski from the restaurant Cochon in New Orleans, Louisiana prepare me a meal. The meal would be roasted goat and fried boudin. My guilty pleasure is definitely braised pork belly. It’s flavorful and is one food I can never turn down!